Clearly delving into scarves quite a bit lately. A friend and I were recently reminiscing about when we used to wear scarves as belts – remember when that was a thing? That scarf is too pretty! You're really the scarf queen this season, aren't you? Oh yeah! Scarfs as belts. You should bring that back 😉 I love this scarf on you and the back of your sweater is so pretty! Love the way you styled that scarf- and those velvet pants are fantastic! obsessing over this! 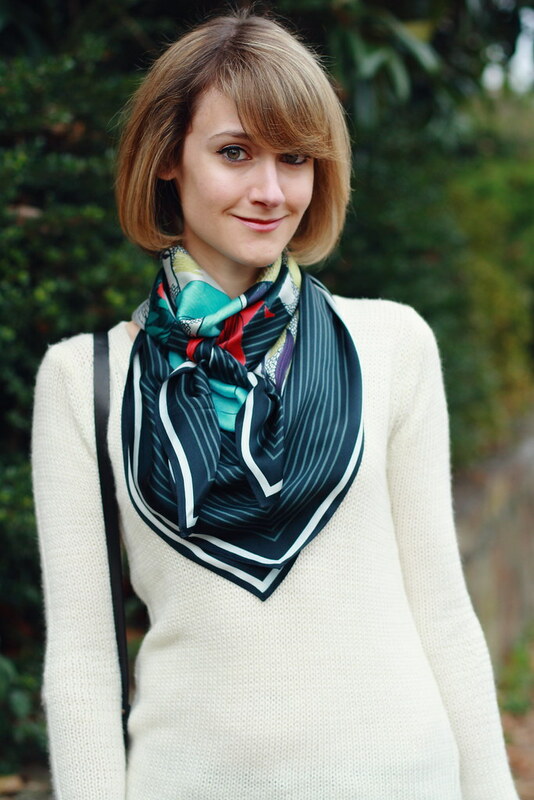 love the scarf you added – makes it so fun! Stunning outfit! The sweater is out of control, love it! The back is gorgeous! You look fantastic!! LOVE this outfit. Great sweater, and the scarf is absolutely PERFECT. You look so chic. LOVE the back of the sweater. that is just the coolest sweater! I do and this look is Suite no matter if your coming or going. PLEASE come over and give me a scarf tying lesson. I cannot make square scarves work to save my life. My weekly dose of proper and sophisticated has been satisfied. Very beautiful. Nice sweater! I would totally wear a scarf as a belt again! This is why i need to get me a scarf like ASAP so cool and girl the back details on the sweater are just fab! Check out my giveaway when you have a chance! love your scarf! you look so pretty! L-O-V-E this scarf and this sweater! Absolutely stunning! Love the colors on your scarf! And the sweater is so nice too. That is possibly the most masterful scarf-tying I have ever seen. And THAT is how you wear a scarf!